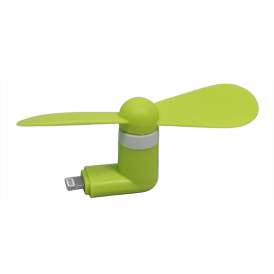 Keep it cool and breezy with a cell phone fan that attaches to your phone's charging port. Choose from the fan with an iPhone connector, an Android connector, or the dual fan that has connectors to fit both. Not intended for children under 3 years of age. Colors: White, black, blue, pink, green, and orange. 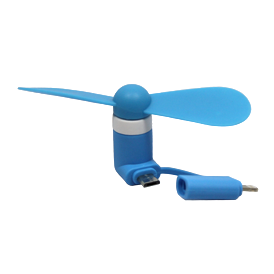 Screened imprint on one blade or fan body. For imprint on both blades add 0.12 (C) and 56.00 (G) if design on 2nd blade is different. 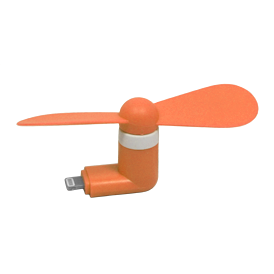 Additional colors are available at 0.12 (C) per color per blade plus 56.00 (G) setup per color. Packaging: Ziplock poly bag with instruction sheet. 3 weeks from approval of pre-pro sample or artwork. Shipping weight approx. 6 lbs. per 100. Pre-pro sample charge 60.00 (G).